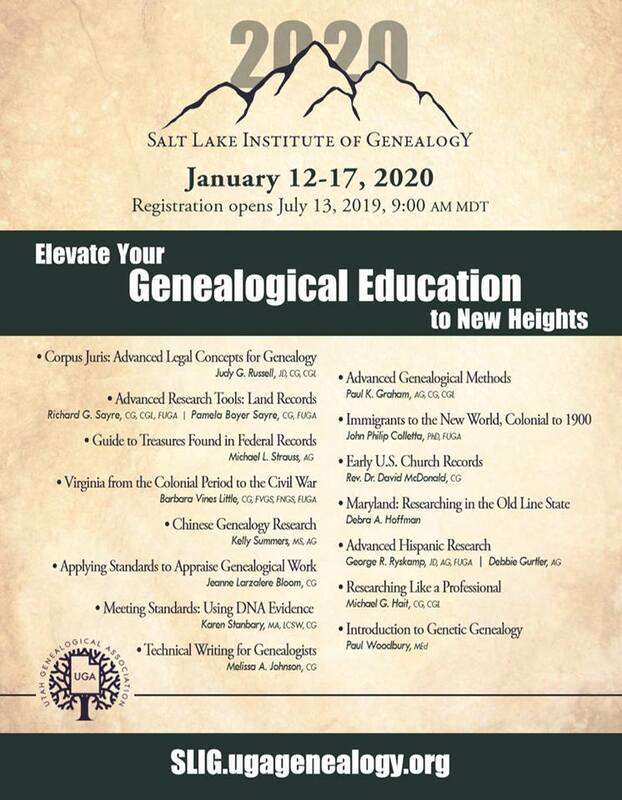 The 2020 schedule of courses for the Salt Lake Institute of Genealogy (SLIG) were revealed at the Friday night banquet on January 18. I encourage anyone interested in genealogy to attend. These are top-flight courses taught by the world’s leading genealogists. Registration for 2020 opens on July 13, 2019, but seats fill fast, so you need to be prepared when the flood gate opens online. I tried to get into Tom Jones’ Advanced Genealogical Methods course last year and became one of those unfortunate souls who was told 2 minutes after registration opened that the course was already full! But it worked out well for me because I absolutely loved my New England to Midwest 1780-1840 course with Joshua Taylor. He’s a great teacher and contributing instructors Rick Sayre and Angie Bush were equally informative. One of the highlights was learning about the major migration routes for the Federal period in U.S. history and looking at maps that showed how my ancestors may have traveled into upstate New York and Ohio and other points west. That was very revealing. I now know for example that my Vermilyea and Mead ancestors probably traveled on a well-worn Indian path in the 1790s from Dutchess County in order to to settle in Roxbury, Delaware County, New York. This is because the first “road” into the area, the Ulster & Delaware Turnpike, was not built until 1804 and we know that both families were already settled in Roxbury before then. The Meads are thought to have arrived by 1798 and the Vermilyeas by no later than 1803. I also really appreciated picking up tips about how to access land records for very specific areas of New York and Ohio having unique land sales histories. For example, the entire Lukemire branch of my tree that feeds into Clermont County, Ohio, is situated in what was the Virginia Military District and researching land records there is different from other areas of Ohio. Likewise, my King ancestors are suspected to have a connection to Summit and Medina counties in Ohio, which was in the Western Reserve Lands of northeastern Ohio. I will almost certainly go back next year. Looking at the 2020 offerings, I’m very interested in the Land Records course by Rick & Pamela Sayres, the Early U.S. Church Records course by Dave McDonald, and the Immigrants to the New World course by John Philip Colletta. These probably fit my current needs the most and I’ve heard all three speak before. Outstanding, all. The Advanced Genealogical Methods course is still a possibility, too. But there’s a surprise in the list. Chinese genealogy research?! Holy cow! I might just have to take that one. I have a background in East Asian studies, so this could be fascinating, even though Chinese genealogical research was not something I ever expected to get into. My wife’s parents are both from Sichuan 四川 province, but she says her paternal great-grandfather may have been from Fujian 福建 province. That’s what she remembers hearing anyway. Of course, many family ancestral tablets and records were destroyed during the Cultural Revolution, including Lucia’s – so I’m not sure how possible it is to reconstruct someone’s ancestry there. Anyway, I’m very pleased SLIG is offering this course and I’ve got until July 13 to figure it out.